So, you wanna make some clouds, eh? I used planes or polygons or floor objects. The behavior is the same, but planes/polys might have an advantage because they are more fexible. With a limited size and a fade out at the end they could be used for special/limited places. Also a camera rotation could be easier. There is only one trick when using planes or floorobjects. Usually they are horizontal. But that gives you real nasty looking objects in the distance - the single planes could be seen or better the single cloud levels will be visible. So you have to use some degrees (6 to 12) to tilt the planes and you get rid of that. That is also the reason why you can't use spheres. If you want to get a closed sky better use triangles arranged in a circle, as shown in the picture below. Picture two, Planes arranged for 360°. Now do the following. Create a plane at 500m hight (y=500). Size of the polygon should be 6000x6000 you don't need subdivisions. Make an instance from the polygon and place it 5m above the original. Copy another one 5m above and so on (or use the doublicate command with instances turned on). 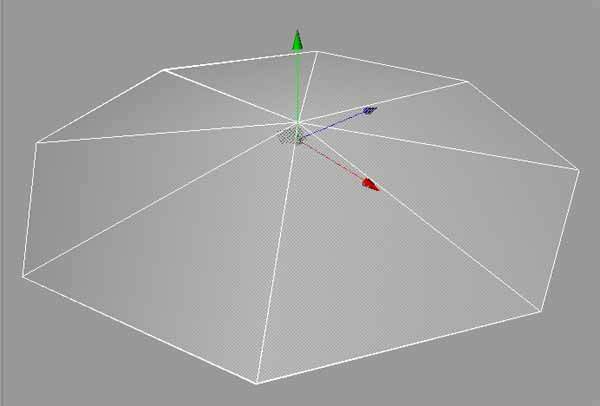 Do this till you have 8 till 12 polygons - you can create more planes (<50) be aware to change the ray depth within general settings! and be aware of more planes longer rendering times. 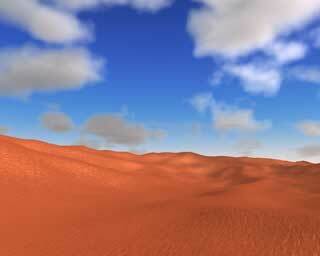 The Sand.avi used 30 planes over 300m. Group the objects. 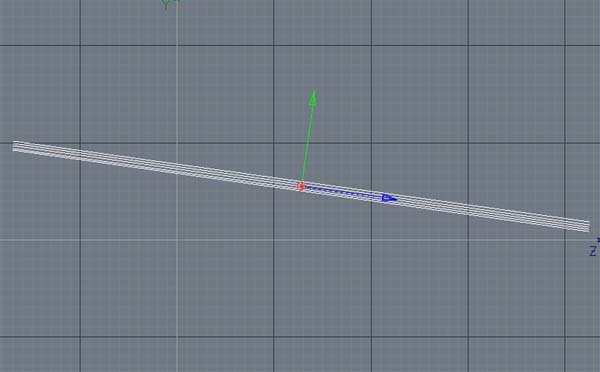 If you think you might try larger distances between the planes use the scale command with y axis. Rotate the grouped object P=-8 degrees. Rotate about H depends on your standpoint. You should look into the tilt. Place the camera close to the floor <10m. Use an SLA 3D-NOISE shader at the Alpha channel. Every turbulence works fine. FBM looks very nice but a little to soft (marocco and sand avi's ). There are a lot of noises that work pretty good. I've done such a lot of tests that I'm not quite sure which shaders could be used (may be naki, luka, nutous but as said, not quite sure). The alpha chanel is most relevant. Not so relevant is bump also it can give nice effects, specular and color, as well as diffusion. 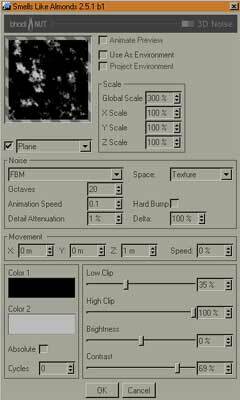 To control you clouds you can play with the size of the material at the object manager. Start with 5000-3500-5000 make it smaller or larger (till 24000m or even more). You should play with the min. max. and contrast values of the 3D-Noise shader ! to get more darker areas (and less clouds). You might try a SLA-gradient with the color? Try it out. For the 'Dark-Cloud' material Try THIS. Luminence: This one was used in all animations. I guess it's essential. You can use the 'normal' luminance but all result have been created with BANJ at the luminace chanel. By chaning the BANJ values you can achive incredible effects. And of course this depends too on the number of planes you use. Attention: To get a better idea on who BANJ works go here. Be aware that this page contains a LOT OF DATA. You should have a fast internet conection or you have to wait. 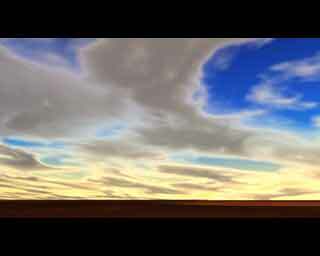 Now you want to animate your clouds. There are two things you have to be aware of. First the movement of the clouds, second the clouds changing. To move your clouds you don't have to move the planes or whatever you might use. Simply move the texture. How is that done. Make a texture sequence for you material. The first key at frame 0 is left unchanged. Place a second key lets say at frame 500. For the Z value use 3000 or -3000. Notice, this value depends on your material settings like projection and size. Have a look at the timeline. The second parameter is set at the Banj dialog. As you can see it above, there is an 'Animation Speed' of 0.1. Be carefully with this value. Clouds change slowly. You might use values between 0.1 and 0.3 in the beginning. Lower values makes the clouds change slowly. This parameter behaves different with other 3D-Noises. But as far as I encountered it's always below 1. The lightning is a mighty point too. But till now I didn't use more than 2 lights. Mostly only one light. The whole scene is pretty resistant against camera standpoint and this kind of things. I said that it's simple, didn't I? If you get really good results, please let me know. If you encounter some new, I would be pleased to participate.